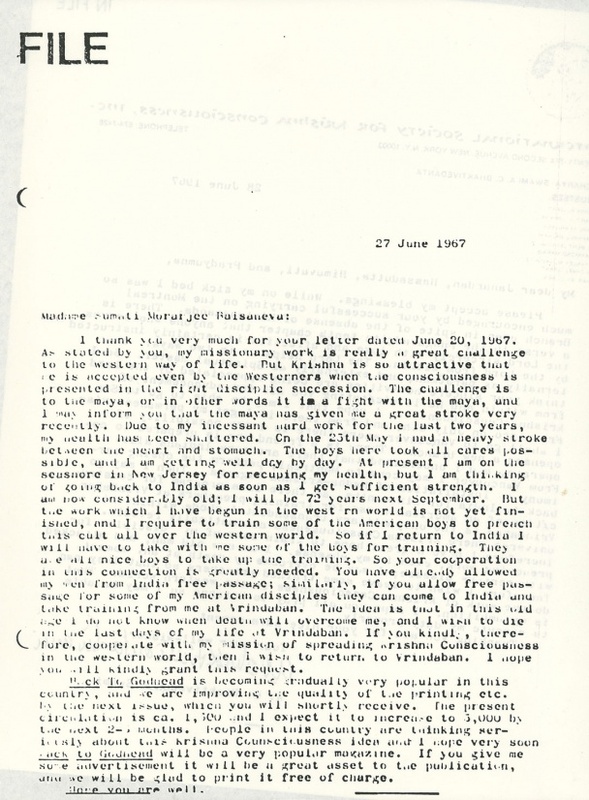 I thank you very much for your letter dated June 20, 1967. As stated by you, my missionary work is really a great challenge to the western way of life. But Krishna is so attractive that He is accepted even by the Westerners when the consciousness is presented in the right disciplic succession. The challenge is to the maya, or in other words it is a fight with the maya, and I may inform you that the maya has given me a great stroke very recently. Due to my incessant hard work for the last two years, my health has been shattered. On the 25th May I had a heavy stroke between the heart and stomach. The boys here took all cares possible, and I am getting well day by day. At present I am on the seashore in New Jersey for recouping my health, but I am thinking of going back to India as soon as I get sufficient strength. I am now considerably old; I will be 72 years next September. But the work which I have begun in the western world is not yet finished, and I require to train some of the American boys to preach this cult all over the western world. So if I return to India I will have to take with me some of the boys for training. They are all nice boys to take up the training. So your cooperation in this connection is greatly needed. You have already allowed my men from India free passage; similarly, if you allow free passage for some of my American disciples they can come to India and take training from me at Vrindaban. The idea is that in this old age I do not know when death will overcome me, and I wish to die in the last days of my life at Vrindaban. If you kindly, therefore, cooperate with my mission of spreading Krishna Consciousness in the western world, then I wish to return to Vrindaban. I hope you will kindly grant this request. Back To Godhead is becoming gradually very popular in this country, and we are improving the quality of the printing etc. by the next issue, which you will shortly receive. The present circulation is ca. 1,500 and I expect it to increase to 5,000 by the next 2-5 months. People in this country are thinking seriously about this Krishna Consciousness idea and I hope very soon Back to Godhead will be a very popular magazine. If you give me some advertisement it will be a great asset to the publication, and we will be glad to print it free of charge.